Of all the major horror movie “franchises” (a singularly odd word for "series"), only one consists solely of excellent, challenging, brilliantly made masterpieces. Of course, I am referring to the Amityville Horror films, which began in 1979 with the original film, based on a true story. 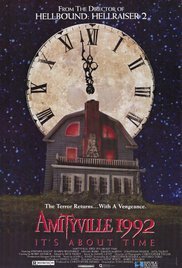 Two of the sequels are based on a book called Amityville: The Evil Escapes; one of these sequels aired on television and the other we shall discuss here: Amityville: It’s About Time (1992), originally known helpfully as Amityville 1992: It’s About Time (1992). Future movie reviews will not be broken into two or three separate posts. I'll start posting self-contained reviews each Monday. That is all. This is Part 3 of our discussion of Demonwarp (1988). You can read Part 1 here and Part 2 here. At this point, Jack follows a zombified Cindy through the forest. The film cuts to the cave in Bronson Canyon, familiar from decades of classic and non-classic films alike. This is Part 2 of our discussion of Demonwarp (1988). You can read Part 1 here. At this point in the story, we have seen bigfoot kidnap Academy Award winner George Kennedy's daughter. The creature has also apparently killed two members of a bigfoot-hunting party, Tom and Fred. Their friends are trapped in a mountain cabin without a door. Later in the night, the three survivors sleep, all of them in extremely uncomfortable positions. I must make another note about the differences between your primitive Universe-X and my more advanced universe. This new comment will join my previous observations about the differences between universes, namely that your nights are considerably darker than ours, you use an incorrect word to describe convoluted Italian thrillers, and your men of the cloth choose their religious denomination at a different time. My latest observation is that in your universe, bigfoot films are not highly respected works of art. I need only point out the names of the classic bigfoot films covered here—Shriek of the Mutilated and Night of the Demon—to prove the error of your universe’s lack of reverence for the genre. 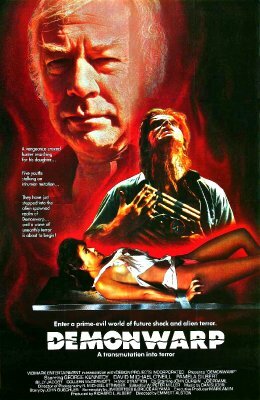 And I need add only one more classic title, the subject of our next discussion, 1988’s Demonwarp, the story of a bigfoot from space (more or less). This is Part 3 of our discussion of the 1970 film Mark of the Witch. You can read Part 1 here and Part 2 here. At this point in the story, the witch from three centuries ago has possessed the body of college student Jill and moved in with Jill's boyfriend Allen in the home of Professor Stuart, ancestor of the man who betrayed the witch in an earlier life. Allen, Professor Stuart, and the witch have a nice breakfast with, as might be expected, Harry's occult murder the topic of conversation. The witch, a brilliant strategist, plays mind games with Allen. When he asks why she killed Harry, she says it is not her fault their friend Jill had murderous impulses. After all, if they told the truth, Jill would be implicated as the murderer. Allen is thoroughly cowed by her cold logic. The professor asks how long the witch will be in control of Jill's body. "I am Jill for as long as I must be and as long as I am, you're helpless." But the witch has not counted on Sharon, Harry's girlfriend. After knocking politely, Sharon pushes her way into the house to confront the witch. Sharon knows Harry was at the grove because of Jill. The witch uses another stratagem worthy of the tragedies of Shakespeare, or even of Three's Company. She tells Sharon that Harry had planned to ask Sharon to marry her, and he was in the grove to ask Jill how he should propose. Of course, Sharon is overjoyed to hear all this. She is no longer suspicious of Jill, even trusting Jill to give her some kind of potion. Sharon drinks quickly. "A fitting memorial," the witch says, and there is a sinister musical sting. "So you can be with Harry, Sharon," the witch clarifies after the potion is drunk. The witch pulls the same trick on Sharon that she played on Harry. Sharon is now unable to speak for herself. The witch means to induct Sharon into the coven, as she apparently did with Harry the previous night. Meanwhile, Professor Stuart and Allen are at an Italian restaurant, complete with a wicker bottle of chianti. They are making fun of a spell in the red book that calls for boiling herbs, identified by the professor as stimulants and aphrodisiacs, in brandy to drive out evil spirits. Stuart believes the recipe as written is incorrect. Somehow he knows the correct spell despite the errors in the book. His occult powers appear to be kicking in. Later, at his desk, a sleeping Professor Stuart writes the key to the spell in his notes. The key involves enveloping the witch with a symbol of goodness. Meanwhile, the witch has taken Sharon to the grove to complete her induction into the coven, which involves, as it must, opening her shirt to reveal her bra, as well as branding Sharon with the mark of the witch. The witch cackles madly at the successful spell. The next morning, Allen wakes up on Professor Stuart's sofa. "If we could just get her to tell us what she's going to do next," Allen laments, ignoring or forgetting their previous attempt to do just that. "Maybe Harry was enough." Allen is interrupted by a phone call informing them that Sharon has also been killed. Later, at what appears to be a ski lodge, Allen and the professor are still discussing the problem when the witch enters. She informs them she is done with Jill's body. It is time for the charm to be reversed. They are in luck, for the signs will be right tomorrow. Tomorrow, they set up a table to perform the reversal. Allen enters with a paper bag, saying "Hardware store was closed, so I had to go to one of those drive-in grocery stores. This was all the extension cord I could get." They are wiring the living room as part of some unexplained plan that is set to go off at 10:15 with an automatic timer. Probably sensibly, they do not trust the witch. At 10:00, the witch arrives to perform the ceremony. Allen and Professor Stuart play their roles in the spell, even drinking a potion from a wine glass and sitting still while the witch unsheathes a knife. As part of her invocation, the witch reveals her plan to bring "the Stuart" back into the coven tonight. She calls forth the coven, naming their names (Dagon, Asmodeus, Leviathan, etc.). Nothing responds, but the witch continues to unspool her plan by raising the knife over Professor Stuart. At that moment, however, the electronic timer activates. The result is a projection of a cross onto the witch's face. Indeed, this plan did require a long length of extension cord. It is fortunate the drive-in grocery store was open! The witch screams as lights flash around her. The image of the cross has succeeded in separating the witch from Jill's body. Allen and the professor grab Jill and carry her away while the witch is imprisoned against the wall by the beam of light. They subdue the witch with a silver crucifix, but in a shocking, ambiguous ending, we see that Macintyre Stuart is now at the end of the hangman's rope. He and the witch are hanged together. Mark of the Witch works so well because it is not just an occult revenge movie, and it is not just a supernatural mystery, and it is not just a light romantic adventure. It is all three of these, and more. Where most witch movies simply concern themselves with the tired trope of good vs. evil, the filmmakers of Mark of the Witch are more interested in exploring a question that is more relevant to our times: How would an immortal child of the devil assimilate into the culture of a 1970 Texas college? How would she deal with coffee and table lamps, not to mention negotiating the social environment in order to sacrifice college students to restore her coven. Above all, the film illustrates the hubris of modern generations. When the witch says, "you will remember my words to your dying day, yea, they will be pondered upon by your sons and the sons of your sons until the last star gutters from the sky; they will ponder my words until they gibber in madness and remember unto their unhallowed graves the curse I now lay upon the Stuarts," she probably believes this to be true. However, the Macintyre Stuart of 1970 has no knowledge of the curse. It is interesting for us as the audience to consider how many generations, in fact, did ponder upon the witch's curse. Perhaps one or two generations, but certainly no more. If only the family had pondered her words until gibbering in madness, etc.--they would have been prepared for the relatively predictable occurrences of this film. In addition to shining a light on modern man's hubris, another of the film's many positive qualities is the element of surprise. For example, we do not expect there to be a domestic love triangle between the witch, Allen, and Professor Stuart, but the three of them occupy a high proportion of the film's running time as they cohabitate with varying degrees of supernatural conflict. As another example, an audience might expect Professor Stuart's attempt to train himself in the occult heritage of his family line to play a part in the defeat of the witch, but in fact the witch is defeated by an electric light, an electronic timer, and an extension cord. A final example of the element of surprise is Jill's immediate transformation into the witch. An inferior film might spend some time hinting at the transformation subtly, building mystery, in this film Jill becomes the witch instantly and the audience is made aware of the transformation almost as instantly. Mark of the Witch has no time for such mysteries, as its plot must move forward quickly to show us the details of the domestic triangle discussed above, not to mention to impart the specifics of running a book fair and to eliminate all of Professor Stuart's innocent pets. I believe I have made my point that, contrary to much of your universe's critical opinion, Mark of the Witch is a sophisticated and heady exploration of the sins of the father and the hubris of modern man. Farewell until next time! This is Part 2 of our discussion of the 1970 film Mark of the Witch. You can read Part 1 here. In our story, a group of college students attempted to perform a spell from a red book of witchcraft. Did it succeed? The answer is yes. What will happen next? Read on. Nobody notices the changes in Jill. When Allen drives her home in the pouring rain, she asks, "Is this my home?" Allen thinks nothing of it. In the next scene, Jill has returned to Professor Stuart's house, though she is not wet from the rain. He is letting his dog out into the backyard, despite the rain, lightning, and thunder. Jill is straightforward with the professor. "One acquires an almighty thirst in 321 years, Macintyre Stuart. Or has it been 322?" The professor thinks she is play-acting to prove the spell was effective. She smiles. "Where's your dog?" "In the yard," he replies. "He's dead," says Jill--or rather, the witch possessing Jill. The professor steps outside to confirm the fact, offscreen. The witch proves she is a witch by showing him the mark of the witch--an S-shaped birthmark that both the witch and Professor Stuart, whose ancestor was a witch, share. The witch then describes her nefarious plan, over which she obsessed during her three centuries in hell. Her sinister plan is to learn the ways of the modern world. "To begin with," she asks, "what is that?" "It's called a telephone," the professor explains with annoyance. "It's used to talk to people who aren't here." The picture fades to black, the first act completed. When the film fades back in, the witch who was Jill has learned much about the modern world. She has mastered turning off--and on--a table lamp. Her murderous demeanor from the prologue has shifted to a mild delight that would not be out of place on an episode of Bewitched. "You explain this to me, this...coffee," she says when the professor offers to make some. "What is it used for?" He responds with a history of coffee houses through the ages. The film has successfully shifted from an occult thriller to a light romantic comedy, establishing the beginnings of a love triangle between Allen, Professor Stuart, and the witch. When Allen finds the professor and the witch together, Stuart attempts to tell the truth, but manages to simply sound crazy. However, the witch is able to convince him by exploding the professor's parakeet. With Allen convinced, the witch continues her evil plan by memorizing Jill's class schedule and learning the layout of the campus so she can attend classes. "Even my second sight failed to tell me I would one day be a student in a college...and in a new world, at that." When Jill goes to class, Professor Stuart explains to Allen that Stuart himself was responsible for Jill finding the red book, which had been his family's possession for years. His intention was to demonstrate the power of suggestion. "Needless to say, I never expected anything would happen." "She's got us both over a barrel," Allen says. The witch is in possession of Jill, so they can't act against her. Reasonably, Professor Stuart, convinced by the mark on his wrist, announces his attention to cultivate his own supernatural powers. They begin to read through the red book. At night, the witch who was Jill dances in front of a small campfire in a grove of trees near campus. "Now will I call forth my coven, those 10 remaining steadfast in our vows. Now will I pursue our vengeance against he who betrayed us unto shameful death." She explains aloud that her coven will manifest one by one to carry out their revenge, and to complete their coven of 13 members. Allen meets Professor Stuart at a bar while the witch is busy in the grove. Allen wants to know if the professor really has powers. Stuart is not sure. 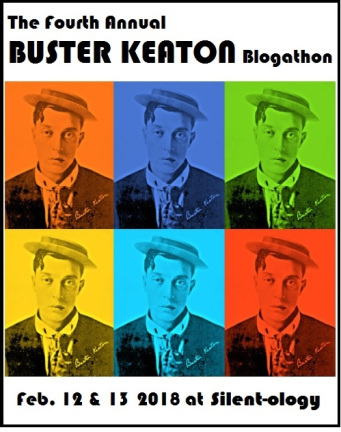 "I have never in my life experienced any supernatural powers...never even won a bingo game." The professor's plan is to order books through interlibrary loan from Cornell, read said books, and find a spell to counter the witch's possession of Jill. They both leave the bar urgently, without stopping to pay for their beers. The professor returns to his home, where the witch seduces him, explaining they were lovers three centuries ago. "Have you considered that I might have an insatiable desire for my first demon lover?" Macintyre Stuart does not resist. Their love-making is approximately as clean-cut as the rest of the film, until Professor Stuart breaks it off, possibly due to guilt. He retreats to his bedroom. The next day is the long-awaited day of the book fair. The witch, posing as Jill, attempts to seduce Harry, the loutish student from the seminar. He agrees to meet her at the grove at midnight. Just before midnight, Harry arrives at the foggy grove of trees. The witch gives him a drink and he is immediately paralyzed. She forces him to recite a vow to give his body and soul to Satan. Meanwhile, at Professor Stuart's home, Allen enters, worried. He thinks the witch took Harry, whose car was seen driving toward the stadium. The professor thinks fast. "Where does Harry go to make out?" "The grove," Allen says without thinking. They make a bee-line for the grove. They find Harry's body. It is unclear if he is dead or near death, because he is clearly breathing. "Mac, let's get out of here," says Allen. "There's nothing we can do for the poor guy now and there's no way we're gonna explain this to the police." They hightail it out of the grove quickly. Things are getting exciting now that murder has entered the picture. Will there be more murders? The answer is yes [spoiler]. Who will be murdered? Find out in Part 3 of our discussion of Mark of the Witch. Which low-budget horror movies performed well at the box office in 2016, and which did not perform well? 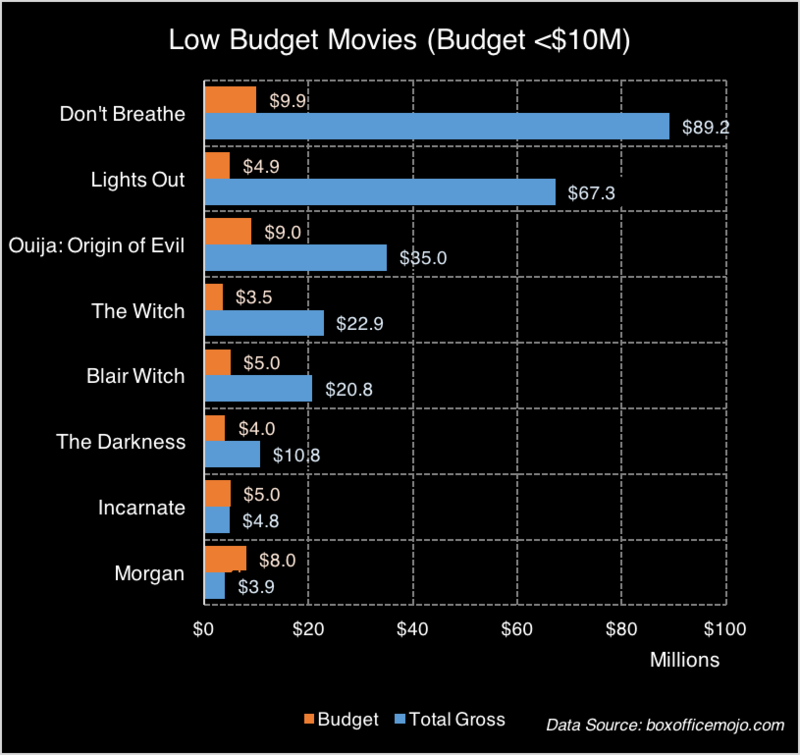 I wanted to look at the financial success of different horror movies in 2016, and I thought it would be interesting to look at movies with relatively low budgets versus movies with relatively high budgets. Of course, "low budget" means different things in different contexts. When you talk about movies with wide theatrical releases in the U.S., most of these movies have higher budgets than those that are released through other channels. 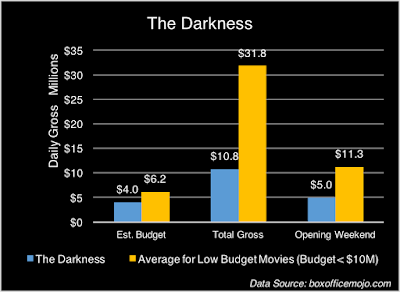 On the other hand, horror movies generally have smaller budgets than movies of other genres that are released theatrically. For 2016, I looked at 16 horror movies with fairly wide releases. Conveniently, eight of those movies had budgets under $10 million and 8 had budgets of $10 million or more. So that's where I separated "low" and "high" budgets: the $10 million mark. The low budget movies, in order of release, are The Witch, The Darkness, Lights Out, Don't Breathe, Morgan, Blair Witch, Ouija: Origin of Evil, and Incarnate. The high budget movies are The Forest, The Boy, Pride and Prejudice and Zombies, 10 Cloverfield Lane, The Conjuring 2, The Shallows, The Purge: Election Year, and The Disappointments Room. 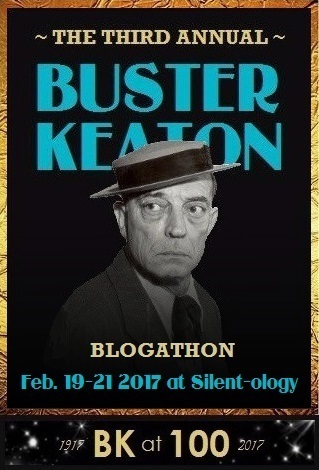 This post will look at the eight low-budget movies, while the next post will look at the high-budget movies. I'm going to compare each of the movies with the average for all eight low-budget horror movies. The graph below shows that the average budget for these eight movies was $6.2 million, and on average they each grossed $31.8 million. Their opening weekends averaged $11.3 million. 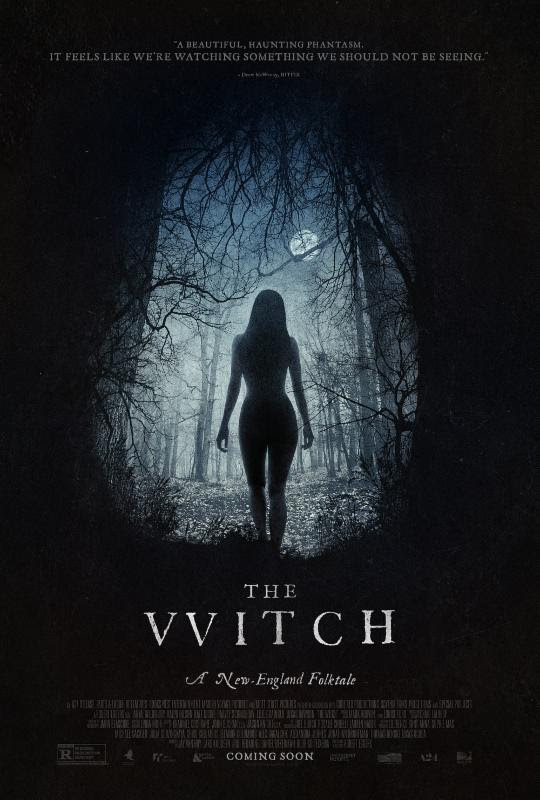 Budgeted at $3.5 million (well below the $6.2 million average of the eight movies discussed here), The Witch was released to 2,046 theaters on February 19, 2016 (in its second week, its theater count increased to 2,204). 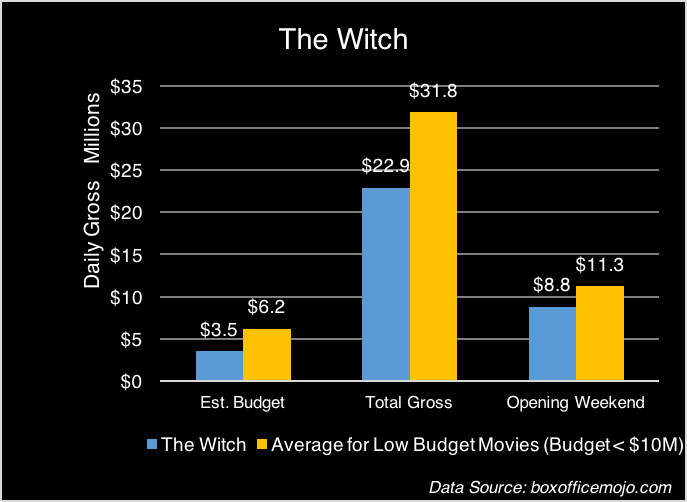 In its opening weekend, The Witch grossed $3.5 million, a little over half the average for the low-budget movies. In its entire U.S. theatrical run of four weeks, it grossed $22.9 million, about 72% of the average for these low-budget movies. The graph below shows daily grosses of The Witch compared to the average for low-budget horror movies in 2016. While its opening was below the average, The Witch's second, third, and fourth weeks were close to the average. 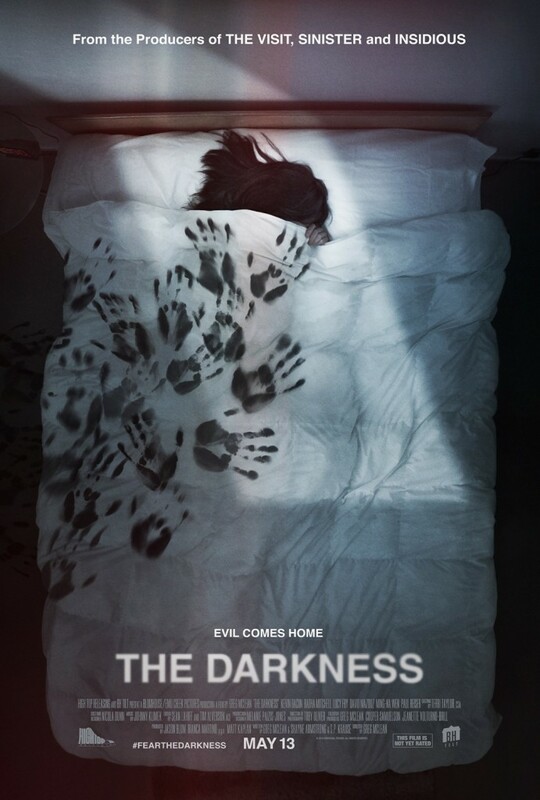 Looking at its daily performance, The Darkness was clearly an underperformer compared to the average low-budget horror movie released in 2016. On most days of its release, it made less than half the average for low-budget horror movies. Looking at per-theater grosses, The Darkness was also an underperformer, averaging only $496 per theater per day in its first week, compared, for example, to The Witch's $811 per theater per day. 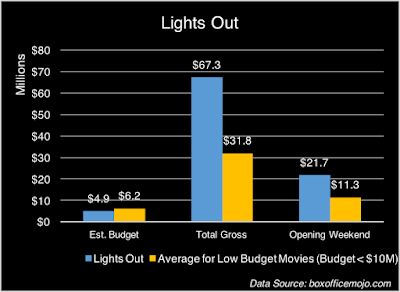 Lights Out, one of the most profitable horror movies of 2016, was budgeted at $4.9 million. It was released to 2,818 U.S. theaters on July 22, 2016, expanding to 2,835 in its second week. Its opening weekend gross was $21.7 million and its total theatrical gross was $67.3 million. The graph below shows daily grosses for Lights Out compared to the average for low-budget horror movies in 2016. Clearly, Lights Out was a massively strong performer in its first week, and it outperformed the average throughout its run. Like Lights Out, Don't Breathe was another major low-budget success in 2016. Released to 3,051 theaters on August 26, 2016 (and expanding in its third week by 11% to 3,384 theaters), Fede Alvarez's movie had a budget of $9.9 million, about twice that of Lights Out. In its opening weekend in the U.S., Don't Breathe grossed $26.4 million, about 22% higher than Lights Out, which grossed $21.7 million in its opening weekend. Don't Breathe went on to gross $89.2 million in its theatrical run, about 33% higher than Lights Out's $67.3 million. 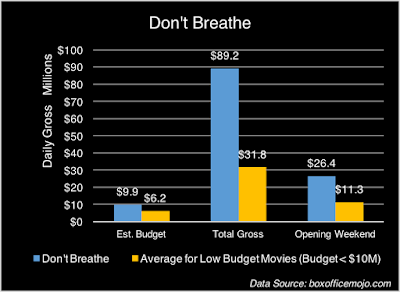 On a daily basis, Don't Breathe showed a pattern very similar to that of Lights Out, opening strong and outperforming the average for low-budget movies throughout its run. 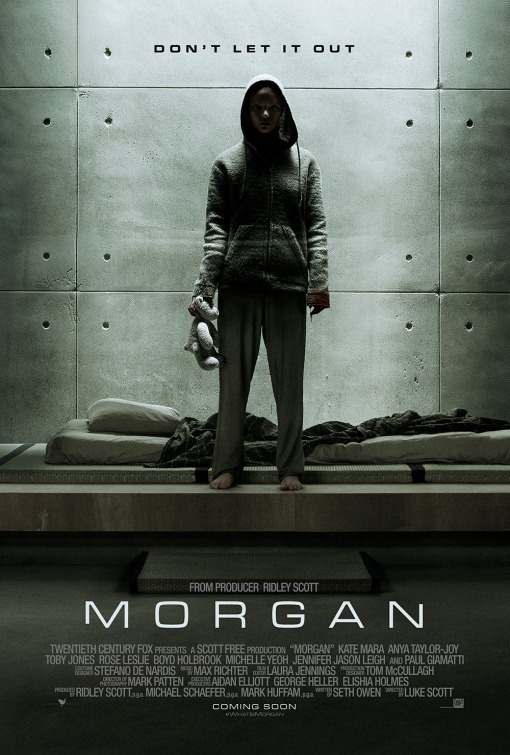 Luke Scott's Morgan, budgeted at $8 million, opened on September 2, 2016 in 2,020 theaters (two weeks later, it would be playing in only 99 theaters). In its opening weekend, it grossed only $2 million, and its entire U.S. theatrical run would bring in only $3.9 million. Based on its theatrical performance, Morgan lost more than $4 million, not including advertising and other costs. Morgan's daily performance, shown in the graph below, was consistently far below the average for low-budget horror movies in 2016. 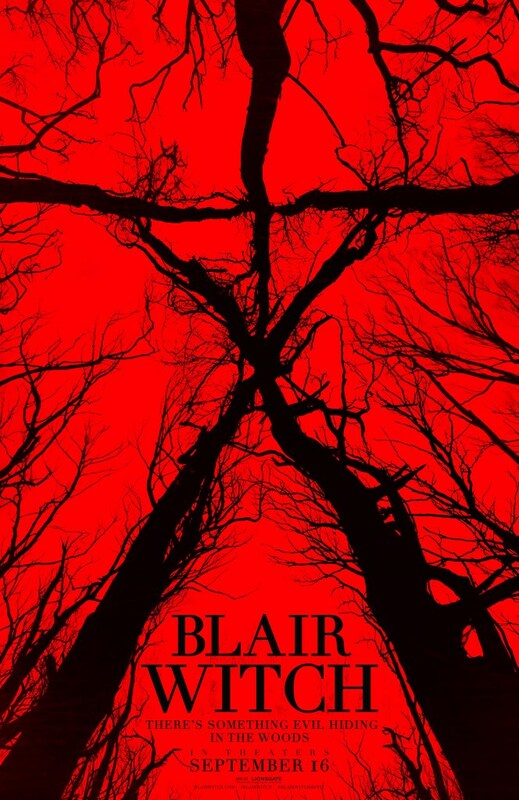 Adam Wingard's Blair Witch revival opened on September 16, 2016 in 3,121 theaters. With a budget of $5 million, it grossed $9.6 million in its opening weekend and $20.8 million in its U.S. theatrical run. 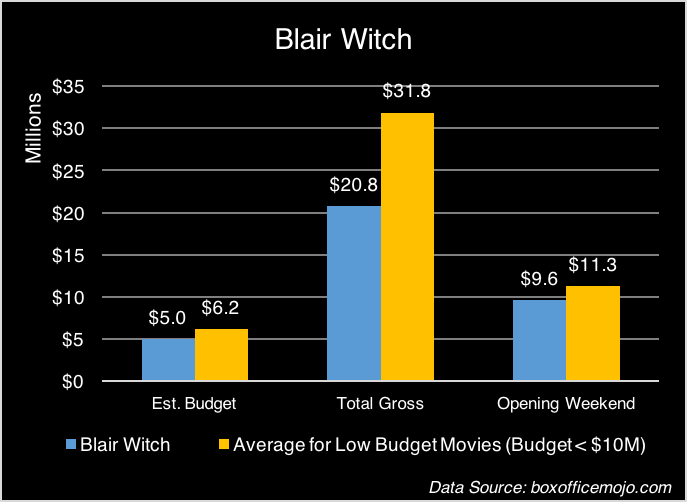 While not a massive hit on the level of Lights Out or Don't Breathe, Blair Witch was most likely a solid, profitable success Lionsgate Films, despite its reputation as a flop. 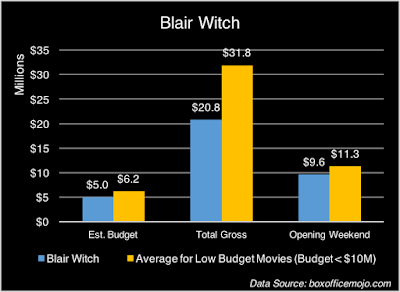 Looking at its daily grosses, Blair Witch's performance was close to the average for low-budget horror movies throughout its theatrical run. Its grosses were slightly below average from the first week, but it showed a solid second week. Mike Flanagan's Ouija: Origin of Evil was budgeted at $9 million. It was released on October 21, 2016 to 3,167 theaters, grossing $14.1 million in its first weekend and $35 million in its U.S. theatrical run. Compared to other lower-budget horror movies released in 2016, its budget was 45% higher than the average budget, and it grossed about 10% higher than the average gross. Looking at its daily performance, Ouija: Origin of Evil opened somewhat more strongly than the average low-budget horror movie in 2016, but after opening, its box office pattern closely matched the average of the eight movies discussed here. Incarnate, released on December 2, 2016 to 1,737 theaters, was budgeted at $5 million. It grossed $2.5 million in its opening weekend and a total of $4.8 million in its four-week U.S. theatrical run. Daily data for Incarnate show a trend similar to that for Morgan, with both movies bringing in about $1 million per day on the first weekend compared to about $4.5 million per day for all eight movies discussed here. 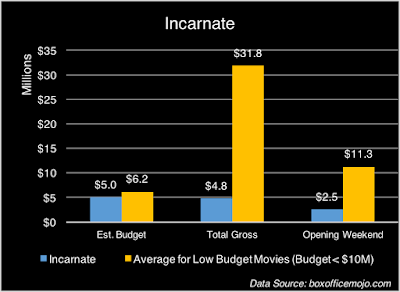 Incarnate played in fewer theaters than Morgan and grossed slightly more during its theatrical run, but both movies grossed well below the average low-budget horror movie in 2016. 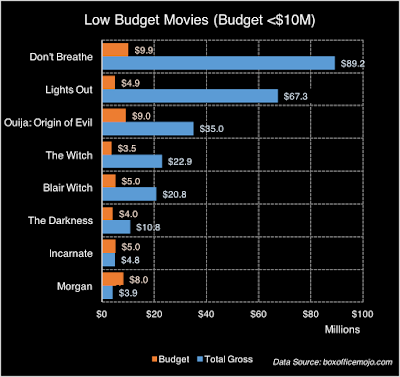 Of the eight low-budget horror movies discussed here, six grossed millions more than their budgets during their U.S. theatrical runs. Don't Breathe and Lights Out were massively successful, each grossing more than $60 million above their budgets. 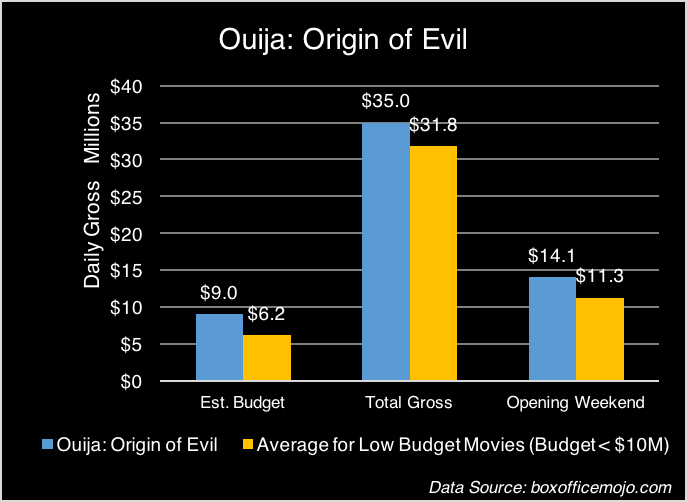 Ouija: Origin of Evil, The Witch, and Blair Witch grossed more than $15 million above their budgets. The Darkness, while not highly successful, grossed almost $7 million above its budget. Two low-budget, theatrically released horror movies grossed less than their budgets: Incarnate and Morgan. 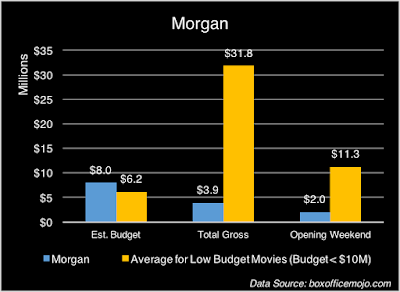 While neither film was successful, Morgan was particularly unsuccessful, grossing only $3.9 million on a budget of $8 million. 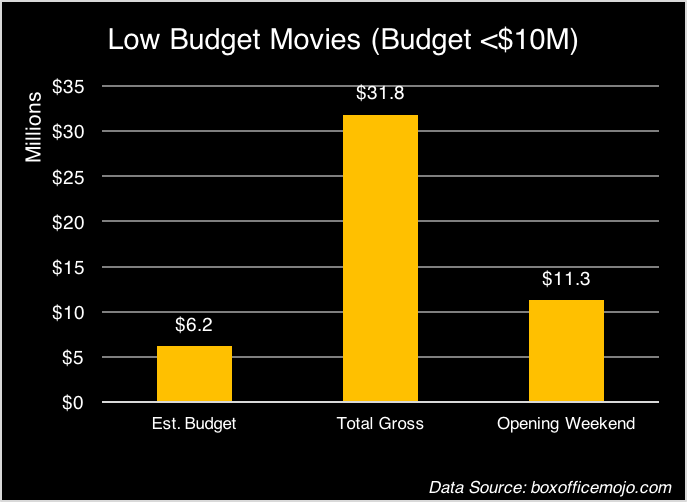 The next post in this series will look at horror movies with budgets of $10 million or above. This high-budget group includes the horror movie grossing the most in 2016, as well as the horror movie losing the most money in 2016.